They have performed with Sharon Shannon, De Dannan and Altan and now the hugely popular and talented Cunningham family from Connemara are set to take centre stage themselves at the Royal Theatre in Castlebar on March 7th with a spectacular new music and dance show called ‘Fuaim Chonamara' (The Sound of Connemara). ‘Fuaim Chonamara' contains a wealth of talented musicians and dancers from all over the west of Ireland. Brian Ó Cuinneagáin headlines the show direct from his US tour with ‘Teada' and ‘Seamus Begley'. He will be joined on stage by his sisters Irene, Ashling and Lorraine, while his younger brother Michael also features as a dancer and musician. ‘Outstanding', ‘really entertaining' and ‘everyone should see this show', were just three of the comments following a recent sell out Cunningham performance at a packed Town Hall Theatre in Galway. "We're really looking forward to our first nationwide tour. We have a really special lineup planned for Castlebar with lots of lively music, mesmerizing dances, wonderful singing and even a few surprises," stated show producer Brian Ó Cuinneagáin. "There is something for everyone in this show. ‘Fuaim Chonamara' is a wonderful celebration of Irish music, song and dance". This new show is an inspiring epic telling the story of Ireland's oldest dance form throughout history. The show is full of raw energy and enthusiasm and captures the imagination of audiences across all ages and cultures. This incredible, unique, entertainment show blends the old and the new, the contemporary and the ancient, the Sean Nós dancing against the more modern step dancing. Sean Nós dancing is highly improvisational, low to the ground, rhythmic dancing in which the performer is free to interpret the music. 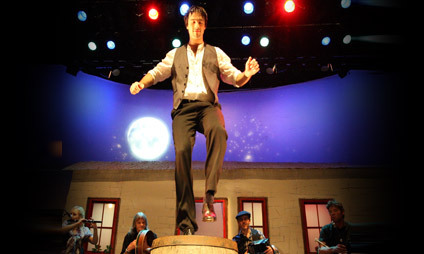 It is believed that American tap and Appalachian Clog Dancing can trace their heritage back to the Sean Nós dancing steps and styles of west Galway. So what better way to see this than on stage at The Royal Theatre Castlebar, overnight packages available at both our hotels call 094 90 23111 for details on packages and pre show dining.